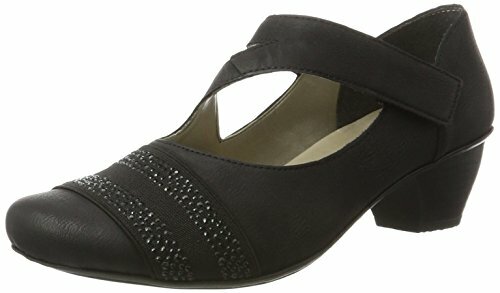 Rieker Women’s 47691 Closed Toe Heels, Black (Nero/Black/00 00), 6 UK. Rieker bring us 47691-00 SARMISTO. These stylish ladies Mary-Janes are ideal for work or play. The black upper of these ladies shoes features rhinestone detailing over the toes while the asymmetrical strap adds a unique twist. Rieker have used a velcro fastening on the strap for an easy to use and adjustable fit. The low block heel adds elevation to these ladies shoes while allowing them to remain comfortable. A cushioned insole pairs with the flexible and shock absorbent sole unit of Rieker’s ANTISTRESS technology for the ultimate in comfort. Built on the ‘SAR’ or ‘SARAH’ last, these ladies shoes will fit the same as any others you have starting with the same start to their names making shopping for your new favourites wonderfully easy. Pair these ladies Mary-Janes with trousers or a skirt for easy to wear style. Buy your Rieker ladies Mary-Janes from Begg Shoes, an official Rieker stockist.